“I know that the reason we made such improvements despite such massive growth was because the Brightree system keeps all the regulations in check. All of those processes are built into the system to meet those regulations and requirements,” says Darcie Peacock, BSW, MS, OTR/L, Solace Pediatric Home Healthcare. When Solace was first accredited as a home health organization through ACH, the organization had 20 deficiencies. After being on Brightree a little over a year – and growing from 15 clinicians to over 60 at the time – those deficiencies dropped to 12. 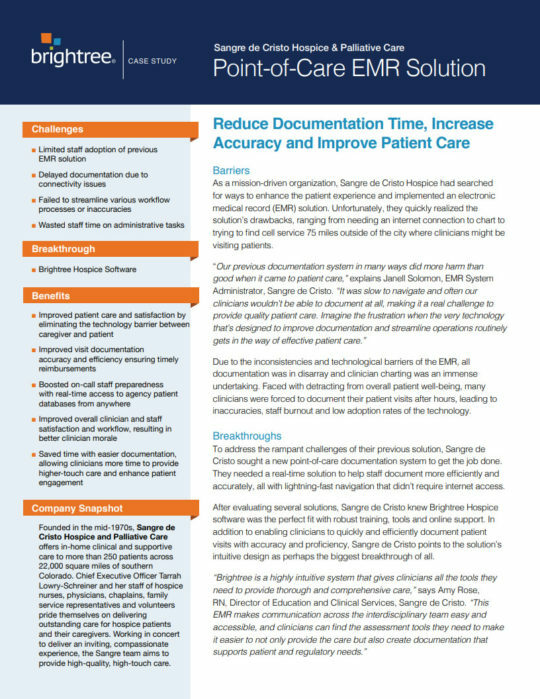 And after another enormous growth spurt to more than 150 clinicians and a patient census over 2,200, Peacock is happy to report that deficiencies dropped to 11 during the 2018 survey.The speed and reliability of the Brightree software has led to a significant increase in documentation accuracy and efficiency. Additionally, since implementing Brightree’s solution, the organization’s patient satisfaction scores have increased dramatically, now ranking in the nation’s top 8 percent.